For those who want more background on this issue, see these two previous posts (here and here). I have decided to go ahead and remove the drug calculators from the app. All the drug calculator code remains in the app and, should Apple ever change their mind(s) on this policy, it will only require changing this single line of code to get them back. I toyed with putting a backdoor into the app to activate the drug calculators, but I realize if I do something like that it would be my last Apple app. I have modified the app to make up for the loss of the drug calculators, and I think that with these changes you will continue to be satisfied by the app. The creatinine clearance calculator had been embedded in the drug calculators, so it has been promoted to its own discrete module (which is something I should have done anyway a long time ago. Instead of the drug calculators, there is a drug reference section. Each of the drugs that formerly had calculators now has detailed dosing information, as well as other useful information, akin to what you find in the Medscape app. (An aside: I think drug dosage information as opposed to drug dose calculators is acceptable to Apple, as it is present in Medscape and other medical apps. Medscape does not meet the Apple criteria mentioned above any more than EP Studios does: it is not “the manufacturer of those medications or [a] recognized institution […] such as hospitals, insurance companies, and universities.”). 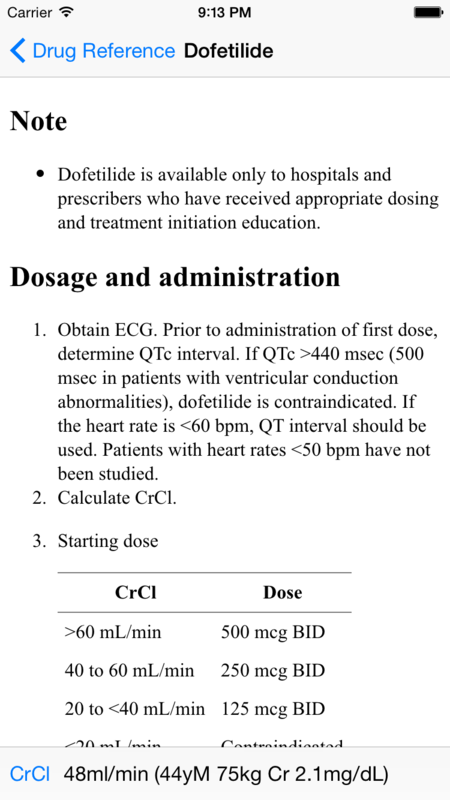 What makes the drug reference section more useful than the similar information in Medscape is that there is a toolbar at the bottom of the screen that allows you to calculate a creatinine clearance on the fly, and then retains that information while you are trying to figure out the appropriate drug dose. Thus the only calculation done is the creatinine clearance; the physician and not the app decides of the dose. In many ways this is superior than having a drug dose calculator, because more information is presented that may be useful to help decide on the proper dose. The drug reference section can also be expanded in the future to include information on other EP related drugs that don’t necessary require any calculations to dose, such as amiodarone or ibutilide. 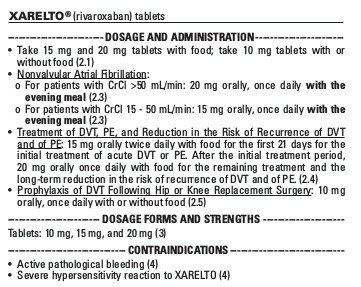 A portion of the drug reference for dofetilide. Note the detailed dosing information and the Creatinine Clearance toolbar at the bottom showing the last calculated CrCl. 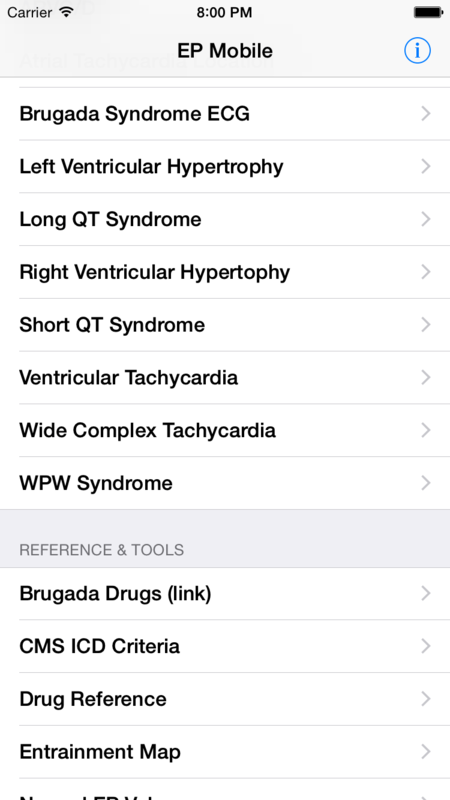 Finally the D’Avila WPW algorithm has been added, as well as a module on diagnosing right ventricular hypertrophy. I have left in the Warfarin Clinic module too. This module was not called out by Apple on the last review, so we shall leave it alone for now. I will submit the update to Apple in the next 24 hours. Their review process usually takes about a week. If the approve it, I will not release the update right away, but will give some advance notice on Twitter. 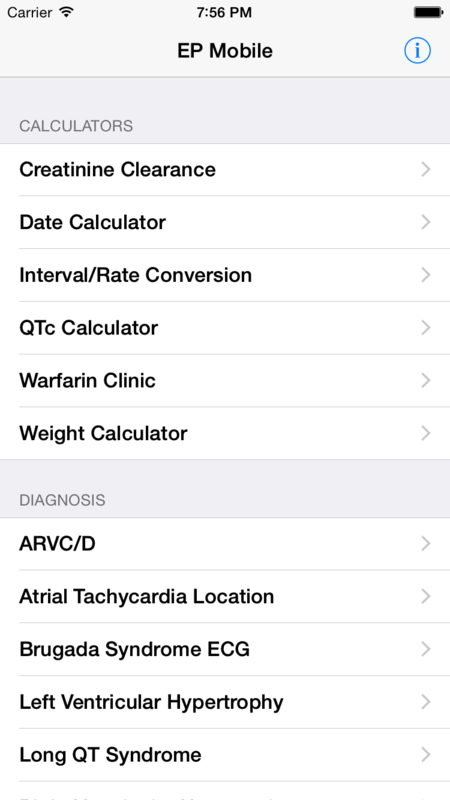 If you really can’t live without the drug calculators, then you should turn off auto-update and not update the app. 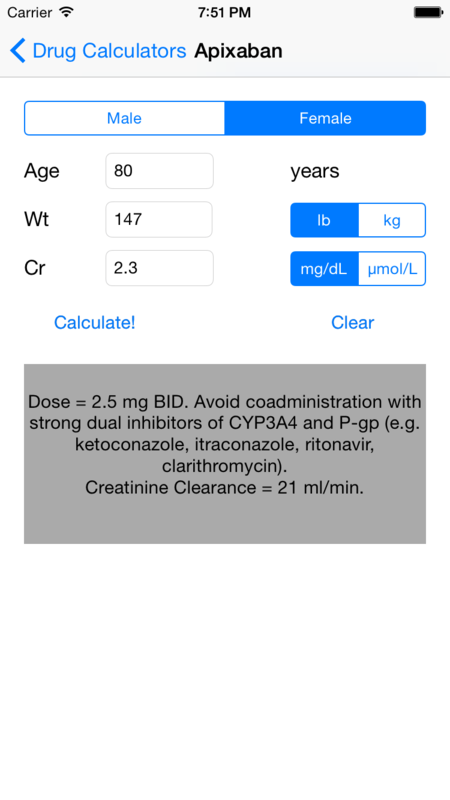 I think though that the drug reference section with the built-in creatinine clearance calculator more than makes up for the loss of the drug calculators, and I encourage you to update the app when it is available. If you happen to be best buds with Tim Cook, let him know that rule 22.9 is stupid and should be sacked. 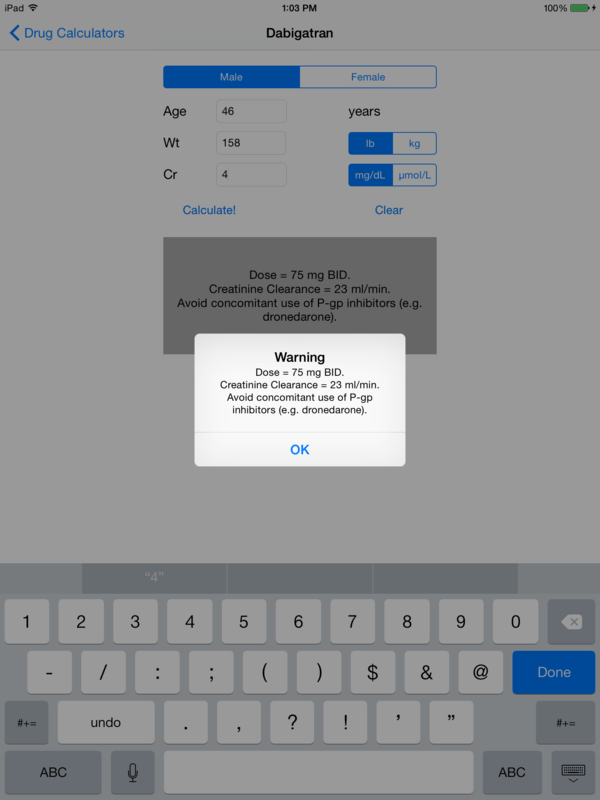 EP Mobile has included such dosage calculators from its very first version, but for some reason the current update (which just added the D’Avila algorithm [PACE 1995;8:1615-1627] for determining accessory pathway location) triggered the discovery that the app was in violation of this rule. I was unaware of this rule, and I don’t think the rule was extant when I submitted the first iOS version of the app in 2012. I submitted an appeal to Apple stating that as physicians have to calculate drug doses every day there does not seem to be any reason a physician-programmer should not be permitted to write an app to calculate drug doses. A drug company could only produce an app for their specific drug, so they could not duplicate the functionality of having multiple drugs from different companies in one app. I don’t see any incentive for a hospital, insurance company, or university to develop this kind of app, though I suppose it is possible they could. As a physician I developed the app because it was useful in my daily work. 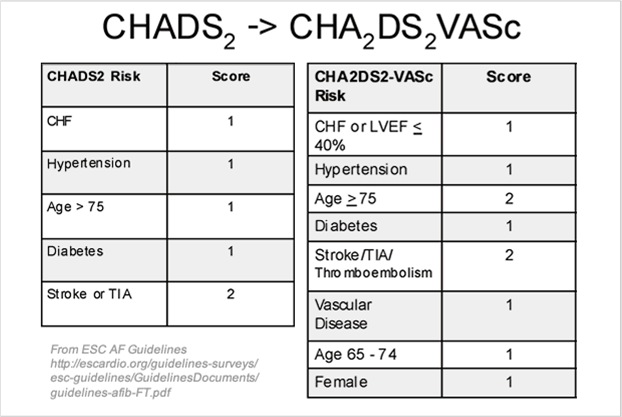 It makes figuring out drug doses for certain anti-arrhythmic drugs or anticoagulants much easier. As far as I know that specific functionality is not duplicated in the App Store. Apple stuck to their guns and maintained the app update could not be approved. On Twitter a colleague tweeted this article from iMedicalApps of June 2013 which discusses the problems that Apple has with drug dosage apps. Apple is probably concerned about the FDA’s potential scrutiny of medical apps and possible legal liability for drug dose calculators that could give erroneous information. In any case this article points out that the Medscape app also provides drug dosing information (though only as written information, not as a calculator — I’m not certain, but it appears that the App Store Review Guidelines may have changed from banning dosing information altogether to just banning dose calculators). Medscape is owned by a private company (WebMD) and is neither drug company, hospital, insurance company nor university. 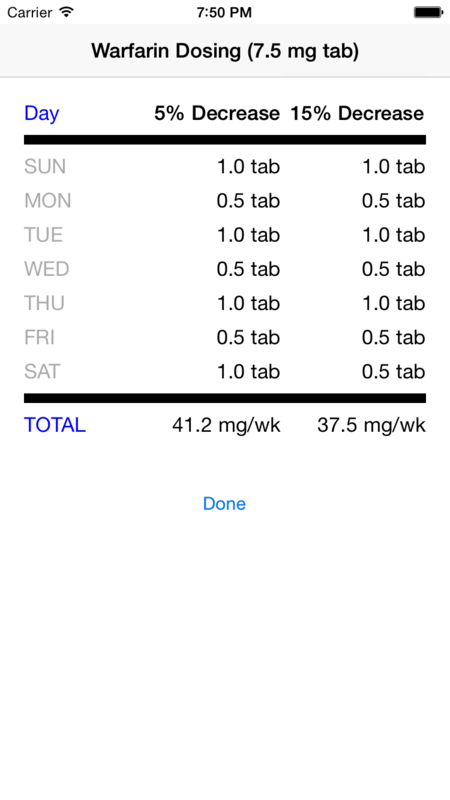 If the Medscape model for presenting drug dose information is legitimate in Apple’s eyes (as opposed to a violation that just hasn’t been noticed yet), it would be possible to retool my app to provide a creatinine clearance calculator followed by the specific dosing information for each drug. This is not as slick as having the answer just pop up in a dialog box, but on the other hand does show exactly what the dosing criteria are and removes the computer from the decision making process. 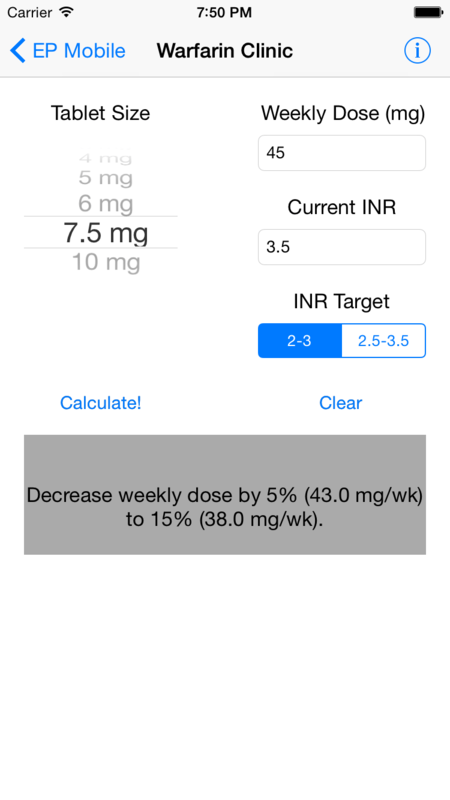 However if I go that route there is no way to save one of my favorite parts of the app, the warfarin dose calculator. It is an implementation of an algorithm from this paper and provides suggested dosing changes for patients on chronic warfarin based on their INR, INR target, weekly total dose, and tablet size. It suggests how many pills the patient should take each day of the week. Whoever makes generic warfarin is not likely to develop a warfarin dose calculator like this, nor is anyone else. At this point I have requested further information from Apple. Apple has rejected the update to EP Mobile, but they have not requested I withdraw the current version of the program (which still has all the drug calculators in it). Certainly they might do so. In the hopes that their position will change, I have decided to withdraw the update and leave the app as is, unless Apple tells me otherwise. This is not a good long term strategy as I like to update the app frequently to keep it up to date with what is going on in electrophysiology, and I am now blocked from making any updates that don’t remove the drug calculator functionality. If I do release an update that does not contain the drug calculators, I will announce it well ahead of time on Twitter and on this site to give users the option not to update the app. I should also point out that the Android version of the app has not been challenged (Android is very hands off compared with Apple).